Brady 104120/ENT-ETSI532 ENTRYTAG Standard Insert is designed to work in conjunction with existing permit to work systems and assist with the requirements of CFR 1910.146 (c) (2), (d) (11) and (f) (2). ENTRYTAG acts as a visual reminder to authorized personnel and assists in instructing non authorized personnel of the critical requirements contained within the permit to work. 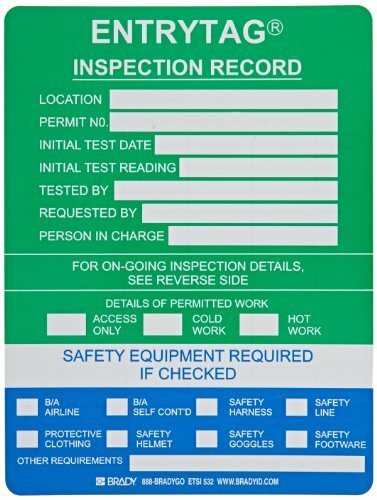 The system clearly states the minimum requirements of entry to the confined space or whether the area is in prohibition and cannot be entered. Inserts are to be used in conjunction with Brady's ENTRYTAGÂ® holder. Vinyl material, measures 5-3/4" height by 7-5/8" width, Green color.